Constructive eviction is every landlord’s biggest nightmare. It is a condition or situation where the landlord doesn’t decide to evict the tenant but rather the tenant chooses to leave the property as they deem it to be uninhabitable. The reason why it is bad for landlords is that the rent they expected to receive is not due because the rental or lease agreement was not honored with the property being uninhabitable, it affects the reputation of the property and can be financially expensive because tenants can claim damages for construction eviction as a result of being forced off the property. 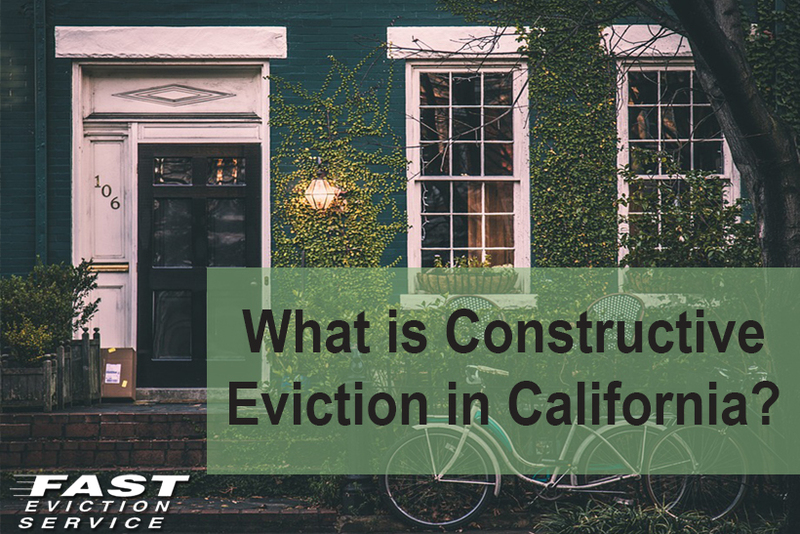 Let’s find out more about constructive eviction. Constructive eviction can be understood as a backdoor method of tenant eviction. It is when a tenant chooses to leave the property on grounds of the rental unit being uninhabitable. Landlords cannot carry out constructive eviction citing issues like tenant’s failure in rent payment or not following the property rules as stated in the tenancy agreement. It is basically a tenant’s right and privilege as constructive eviction happens when the landlord fails to make or keep the rental unit habitable. When does Constructive Eviction Occur? Constructive eviction happens when the tenant realizes that the landlord has failed to live up to his or her responsibilities of the lease. You might already know that landlords need to provide for specific facilities and utilities to their renters. Key requirements include offering a neat, clean and hygienic property to the tenants, and continuous supply of hot/cold water, electricity and gas. Furthermore, to retain the rental unit’s sanitary conditions, the landlord needs to perform regular maintenance of the property. If a landlord fails to abide by these rules and do not provide the tenants necessary living conditions, constructive eviction occurs. What is an Uninhabitable Property? An uninhabitable property is one in which the tenant cannot live in. It is in such a state that compels the residents to move away. What happens is that due to the prolonged negligence of landlord, the rental unit’s condition starts deteriorating and it reaches a point where inhabiting that property becomes intolerable. Living conditions in that property become so severely adverse that it is impossible to live in it. This is why the tenant is forced to leave the property and terminate the agreement. There are a number of aspects that make a property uninhabitable. The landlord can turn off the gas, water and electricity supply. Without basic utilities like light and gas, it is next to impossible to live in that property. Also, there is every possibility that the landlord shows disregard towards a grave environmental problem like flaking off lead paint, sanitary conditions in and around the premises and/or toxic mold. Or, the roofs leak and haven’t been fixed due to which water damage occurs leading to the development of mold. The entrance of the rental unit has been blocked by the landlord. The locks have been changed and renters aren’t able to enter the property. Landlord has taken out bathroom fittings like sinks or toilets, etc. These are some of the issues that can potentially render a property uninhabitable. How Can it Affect the Landlord? Don’t think that it is a positive sign that the tenants choose to evict the property. It is in fact damaging for the landlord because it gives the message that the landlord has failed to carry out the legal duties and responsibilities that he or she is required to by law. When a tenant gets constructively evicted, it is possible that he chooses to terminate the lease and also claim for constructive eviction damages. For instance, if the eviction occurred due to landlord not providing hot water to the rental property and the tenant or any of the family member gets sick, then the tenant will have the right to claim for the damages and demand for payment of medical expenditures. It also will affect the property’s market value and landlord might find it difficult to rent it out again. What do Tenants Need to Prove? If these conditions aren’t met, it becomes difficult to file for any constructive eviction damage claims. Conversely, if the tenants prove that what they are claiming about the property is indeed true and the landlord is responsible for the conditions of the property, then they can make use of a range of legal options. Tenants can fight back against this sort of eviction; initially, they will send the landlord a written notice informing about the eviction. It is however, required by law that landlords are given a reasonable amount of time to fix the issue(s) pointed out by the tenant(s). Reasonable amount of time means that the issue could be addressed in that period. If the tenants give 24 hours deadline to fix an issue that requires more time such as gas or water leaks, then it would be unreasonable and impractical. Therefore, tenants need to give landlord enough time to settle the dispute by carrying out repairs. If the landlord fails to address the intolerable living conditions in a given reasonable timeframe through the written notice, then renters can exercise their right of constructive eviction. They can leave the property anytime they want to without paying the rent that is owed according to the rental or lease agreement. Then they will start legal procedures for terminating the lease and will also look to sue landlord for the damages. How Can You Avoid Constructive Eviction? It is quite simple; as the owner of a property, you must take good care of its living conditions and make sure that renters are receiving basic utilities that the law and ethics of property renting allows them to enjoy. Always make necessary repairs prior to renting out the property and try to make the conditions habitable. Give preference to keep the area surrounding the property like entranceway, alleys, pathways, patios and parking lots clean and do ensure that the property is in perfect working condition when you rent it out. Pay timely attention to leakages, mold, mildew, seepages, drain blockages and crumbling paint. If your property is habitable, then there would be no way left for the renters to undergo constructive eviction and claim damages in California.